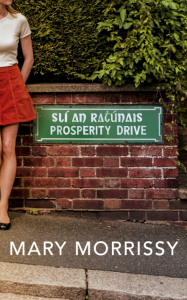 Mary Morrissy’s new collection of short stories, Prosperity Drive (Jonathan Cape) has been garnering high praise since it was published in late February. This is her second collection of stories. She is a lecturer in creative writing in the School of English and the author of three novels, Mother of Pearl, The Pretender and The Rising of Bella Casey. The stories in Prosperity Drive are connected, all springing from a fictional suburban street. Linked by its characters, who appear and disappear, bump into each other in chance encounters and join up again through love, marriage or memory, the form of Prosperity Drive is like an exploded novel. “Prosperity Drive is masterful storytelling: moving without being sentimental, poetic without bring pretentious, and emotionally resonant in its minute dissection of ordinary life. It is surely one of the best Irish books you will read this year.” – Sara Keating, Sunday Business Post. Prosperity Drive will be launched in Dublin at The Rathgar Bookshop, Wednesday, March 23, at 7.30pm. It will receive a Cork launch during Cork World Book Fest at the Triskel Arts Centre on Saturday, April 23. This entry was posted in News on March 18, 2016 by Jools Gilson.